General laparoscopic principles should be adhered to regarding port placement and closure. This topic is covered elsewhere in this text. Excessive bleeding is a bothersome complication, not because of the amount of blood lost with regard to hemodynamic stability, but because even a small amount of bleeding obscures vision. Bleeding may be encountered at different steps of this procedure. Occasionally, when the endopelvic fascia is opened there is bleeding which can make the apical dissection more difficult. In such cases, a "cottonoid" Codman surgical strip may be placed on either side of the prostate. After the prostate has been removed, if there is bleeding in the area of the neurovascular bundles or prostatic fossa, a hemostatic sealant, such as, FloSeal® Matrix may be used prior to the anastomosis. Furthermore, additional dorsal venous complex sutures [2-0 Vicryl (polyglactin), RB-1 needle] may be placed after urethral transection, if necessary. If there is concern regarding the integrity of the anastomosis, additional interrupted sutures [2-0 Monocryl (poliglecaprone) on an SH needle] may be placed to minimize anastomotic leaks. 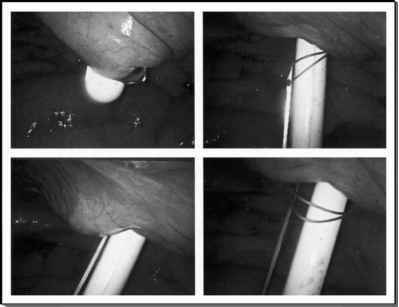 Furthermore, the bladder can be tacked to the pelvic sidewall to prevent tension on the anastomosis in the event of significant ileus or pelvic hematoma. Also, the peritoneum over the bladder can be sutured to the pubic arch in a running fashion to essentially extraperitonealize the retropubic space. We have tried all of these maneuvers and have concluded that they are not necessary in the vast majority of patients. Postoperatively, if a patient has a significant ileus or abdominal pain, consider computerized tomography scan of the abdomen early in the evaluation. The vast majority of patients have minimal abdominal pain and a rapid recovery. If there is a deviation from the usual postoperative course, then an aggressive evaluation should be performed to exclude a hernia, urinary ascites, significant ileus, or pelvic hematoma.